For the last several years my wife (Laurel) and I have taken two plus week vacations and traveled around the US. I documented each of these trips with a daily recap I posted on Facebook. Some people enjoy reading these accounts of our travels so I’m frequently asked where we’re going this year and will I be writing about it. This year, Laurel and I were asked to attend the LeadingAge PA conference which was held in Hershey, PA. So I decided to kill two birds with one stone. I am writing about the trip to Hershey for both Continuum CRM and for the people on Facebook who like to read about our travels. Laurel was asked to attend the LeadingAge conference to help set up and staff the Continuum CRM booth. I think I was asked because I fit the profile (active seniors in their sixties and seventies) of the new target market for senior living! We started our trip on Sunday from Hartwell, Georgia with plans of taking our time while driving half-way to Hershey on the first day. After several hours of driving, we got onto the Blue Ridge Parkway at Fancy Gap, Virginia and headed north. So how does our first day of travel connect to Senior Living and Continuum CRM? WAZE. WAZE is a social navigation app that alerts users to traffic conditions, road hazards, police warnings, and more. I fell in love with this app several years ago, due to its interaction with your driving experience, its ability to reroute you around trouble, and its ability to give you several routes for any trip. Recently WAZE was purchased by Google. That’s where the trouble began. WAZE has gone downhill ever since. During this trip, it was so bad that I finally just removed it from my phone. I think this happens to a lot of good software companies. They either get bought by a much bigger company that destroys what made them successful or they grow so big they lose sight of things that made them successful. With Continuum CRM, we’re not looking to be bought by some larger company. While we are growing, we will always keep our focus on our customers’ needs and do everything possible to make sure they are successful. We have grown this business based on customer service and will always keep that as our central focus. As a Senior Living provider, you too must always keep your focus on your customers. We started the day with a large snapping turtle in the parking lot across from our car. You never know what you might see when you stay in a town call Troutville. The morning was otherwise uneventful. We stopped for lunch at Roma’s Casual Italian. Roma’s is a wonderful restaurant in Stephen City, VA that we have eaten at before. If you provide good food, great service, and reasonable pricing you’ll get loyal customers even if they’re 3 states away. In the Senior Living business, this is also true. If you provide a good community to live in with great service before and after the sale, you will get referral business from your residents, even if the referral is in another state. We decided to not use much imagination when it was time for dinner. We went to an Olive Garden. I don’t think I will go to another Olive Garden anytime soon. We had a tablet on our table that had the menu and games. I messed around with it a little, but didn’t find it very interesting. When it was time to pay, I was told that I had to pay via this tablet. I looked at the bill and found it had a charge for games. I called the waitress over and she said she would take the charges off. Once that was finally done she told me to try to pay again. I hit the tip button on the tablet and it wouldn’t do anything. So, I called her over again. She said that I had to put the credit card in first and then the tip button would work. Once I did this it allowed me to pay and leave a tip. I then hit the receipt button. It made some noise but was obviously out of paper. I called the waitress over again and she went away to get a receipt printed. I left a very unhappy customer. Not because of the food or the service. but because of the technology that is supposed to make things easier and faster for the customer. I’ve been in the technology business for more years than most people have been alive. If there’s one thing I hate it’s technology that is wrongly applied and poorly supported. If they’re going to force customers to use this technology, then the waitress should have offered to do a little overview before we started. Especially since it was not intuitive and there was no help or documentation available. If they’re going to use tablets instead of cashiers, then the software should be user friendly enough so that a non-technical person can make it work. I can’t imagine how someone in their eighties who has never used such technology before would use this. And lastly if they’re going to make you use this tablet to pay, they should make sure it has paper for the receipt. From a software provider’s prospective, when we provide software to Senior Living communities we need to make sure that the system is configured to not only match the role of the user, but also intuitively help users do their jobs. We must provide comprehensive role based training for each user and we must support our customer at every turn. I think someone dropped the ball with this tablet thing at Olive Garden. As a result, they’re likely losing customers. I know that they lost me as a customer. When you decide to put in a CRM system for your team, make sure you don’t skip any steps. The system must help the users do their jobs and be easy to use. This is accomplished through role based configuration of the system. You must train and train and then train some more. At first the training should be on basic usage of the system and as the training progresses, the target is to ensure that the users know how to leverage the system to help them do their job more effectively. And the most important thing you need to do is make sure that the CRM software you select has top notch support. After spending the night in York, PA we had a very short drive to get to Hershey and the LeadingAge conference. Today was setup day, but we couldn’t get in to set up our booth until after 1PM. We arrived at the Hershey Lodge Conference Center around 1PM and with the help of Kristin Hambleton, Continuum CRM’s VP of Sales, we started setting up the booth. It was more like Kristin and Laurel started setting up the booth. I provided moral support or more accurately I just watched as they set it up. Once completed, we went to check into our room at the Lodge. Check-in reminded me of checking into a Disney hotel. You enter a queue in front of a large check in area with probably 20 or so uniformed check-in agents. The line moved quickly. All the agents were very friendly, knowledgeable, and efficient. The staff could pull up the details of our stay immediately and answer every question guests threw at them. What can we learn from my pleasant check-in experience? Make sure your employees have the tools they need to succeed. In Senior Living and CCRC sales your employees need to have the best software tools available. If your company has an old, hard to use CRM system with limited functionality, like the lack of email marketing or forward-looking technology, then your need to consider upgrading to a new CRM system. If you don’t have a CRM system, you aren’t giving your people the tools they need to succeed. 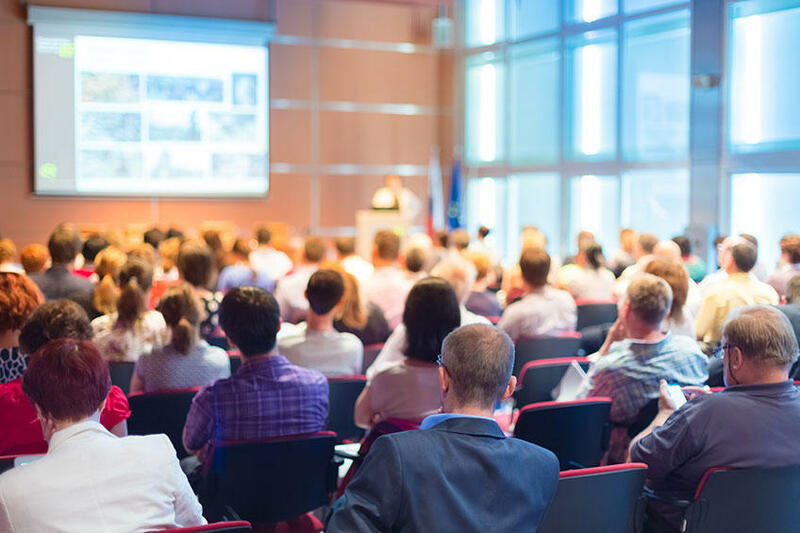 A great way to support your employees is to let them attend educational conferences like LeadingAge PA. This conference is a good mix of educational speakers, vendor displays, and networking sessions. I was very impressed at the turnout for this conference and the level of education that the attendees receive. I was also impressed with the LeadingAge staff for running a flawless conference. The Hershey conference center staff and facilities were also great. The Continuum CRM booth was set up in the hall out in front of the exhibit hall. People could come by our booth anytime during the conference. The exhibit hall was only open 2.5 hours a day so we had much more traffic than we would have had if we had been in the exhibit hall. We had a lot of great conversations with potential customers and potential partners. Kristin gave a few demos in the booth and scheduled several for the following week. Kristin is friendly to everyone, remembers names, knows the Continuum CRM product inside and out, and most importantly knows the Senior Living industry having spent many years working in sales for a large CCRC. On the first night of the conference, they held a networking event in the hall between the meeting rooms and the exhibit hall. Our booth was right in front of the last table which had the desserts on it. As you would expect, Hershey knows how to do dessert. The networking event was a great success for us, but we all ate too much. The second day of the conference was more of the same. We had a lot of interest, and this being our second year at the conference, we had a lot of people who seemed interested in Continuum CRM this year that last year didn’t really want to talk to us. The exhibits ended on the second day and all the exhibitors rushed to get their booths taken down and loaded. We loaded up all our stuff and Laurel and I headed back toward home. Kristin stayed and was finally able to attend some of the sessions since she didn’t have to worry about our booth. I think the take away from the conference for me was again just how well run this conference was run and how much value it brings to the Senior Living industry. I always say that the best way to invest in your company is to invest in your people. LeadingAge conferences are a great investment for your company. We started our drive toward Georgia about 3PM. When we got to our hotel for the evening, we found that it was full of older softball players. Funny that we left a conference about active senior living then find a bunch of very active seniors at our hotel. I spent some time talking to these senior athletes about their softball league. As they were sitting on the back of a pickup truck drinking beer, they gave me some details about the league. I was told that there are 3 age groups: 55 to 59, 60 to 69, and 70 plus. I was talking to a team all over 70, but all three groups were staying in our hotel. One of the guys told me that he isn’t retired yet so he only plays about 250 games per year. He said many of the guys play in 500 plus games and travel all over the US to play. They play 2 or 3 games a day during each tournament. He said if you wanted to you could play in a tournament every weekend of the year. I was so impressed with these guys and how healthy they were at their age. These seniors are your clients today and in the future. They are active and healthy and are living longer. Your communities must find ways to connect with these more active seniors. Using a product like Continuum CRM will help you connect and service these clients, but your communities also have to be attractive to these seniors. Schedule a free Continuum CRM demo today. Scott is one of the co-founders of Continuum CRM. In addition to being a US Navy Veteran, Scott is a seasoned sales professional who has more than 35 years of sales, sales management, and operations experience working at Westinghouse Electric, ABB, Invensys, Formation Systems and SFA Strategies.